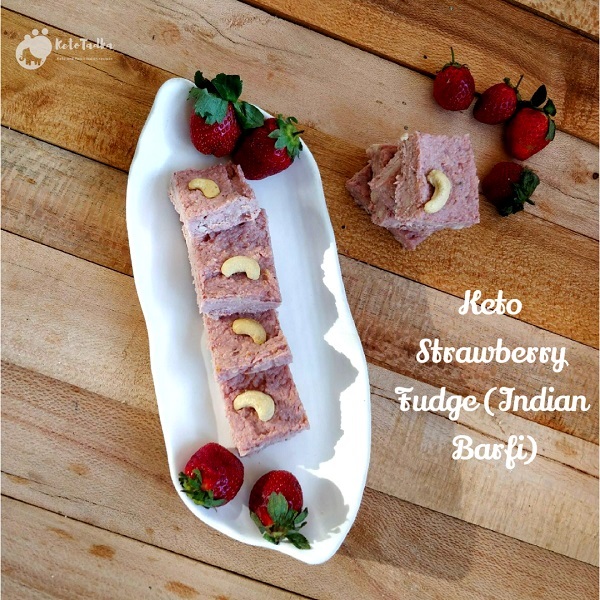 Today, we are making Keto Strawberry Barfi Keto barfi which is pretty low in carbs and yes, obviously tasty. 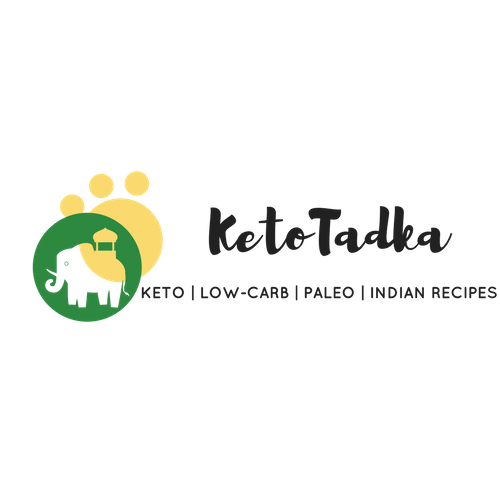 You will need basic ingredients from the pantry, although you need to make Keto Condensed Milk for this . Along with that you need Unflavoured whey protein powder to make this. You will get the product link in recipe notes section below. Other than that, the ingredients are easily available. As you see in the above picture, the texture is smooth and not very hard. When kept out of the fridge for 10 or more minutes, it starts to melt a bit but doesn’t disfigure. You will have a gooey bite as a thick pudding if you keep it longer outside. 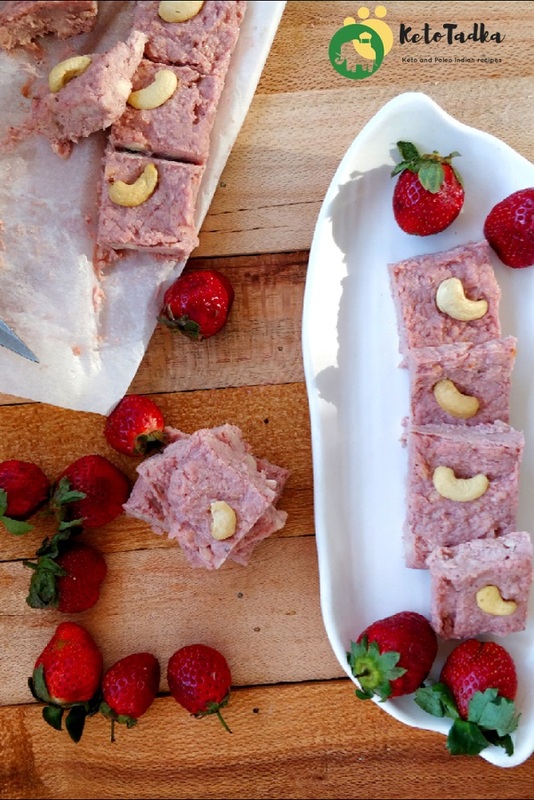 Make strawberry pulp and keep it aside. Melt butter/ghee in the pan. Add the whey protein powder and mix well. 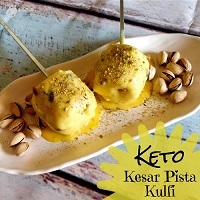 Add the crumbled paneer and keto condensed milk and mix well. Make sure the paneer is finely crumbled than that shown in the video as more finely crumbled it is, easy for you to break lumps. Break all the lumps and keep mixing the barfi mix until it no longer sticks to the pan. It takes 10-12 minutes to reach this stage. Keep the flame always on medium. Add the strawberry pulp and mix till there is no more moisture. Add the unsweetened dessicated coconut powder , sweetener, cardamom and mix well. Again, mix until the barfi mix doesn't stick to the pan. Takes another 10 minutes. Switch off the flame and remove it in the tray. I used a square deep dish or tray with 20 x 20 cm in dimensions. Spread evenly with a spatula and garnish with cashews. Make desired cuts ( 16 barfis) before freezing. Wrap it with foil and freeze for 4-5 hours. It can even take more depending on how moist the barfi mix was. It should feel firm when pressed. Cut the barfis with a sharp knife and enjoy ! You can freeze them in the freezer for 3-4 weeks. De-frost before serving. They can be stored in the fridge for about 5 days. UNFLAVOURED WHEY PROTEIN POWDER RECOMMENDATION- Buy this one.